Tokyo-based designer Shinya Oguchi recently exhibited his Lightness Collection ? a bench, a coat stand, a lamp, and a flower vase. 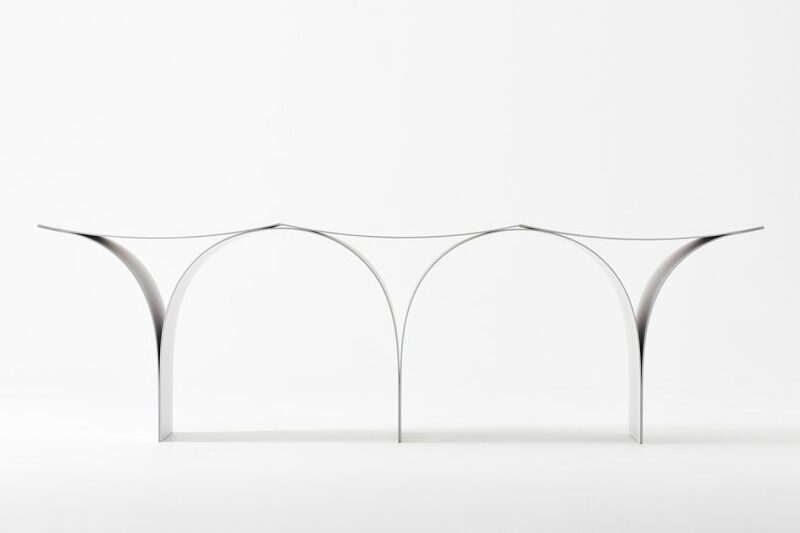 Tokyo-based industrial designer Shinya Oguchi recently exhibited his Lightness Collection in the Greenhouse section of last month’s Stockholm Furniture Fair. The four products in the collection ? a bench, a coat stand, a lamp, and a vase ? are each very well thought out and executed. Arch is a steel bench with ranged arch structures denoting the three individual seats and welcoming people to sit for awhile. When not in use it becomes a beautiful structure of its own. Twist is a coat stand comprising three twisted steel plates. The thin, manipulated pieces attach to a core piece in the center, making the structure feel light in appearance and taking on the look of a piece of art. Dish is a versatile steel lamp with a dish-shaped reflection plate intended to spread the light source. The lamp itself rises up on a thin rod with a cone-like light, which helps it to create unique shadows. This one piece can be used in four ways ? on a table, hanging on the wall, as a pendant, or as a floor lamp. Picture is a flower vase with curved back plate that can be hung upon the wall, its concave backing bent to accommodate room for a flower or two. The steel case itself is divided into two parts, the vase and the stand, and assembled with a strong magnet that allows you to style the piece in various ways.